Brockport Village Hall is located at 49 State Street, Brockport NY 14420; phone: 585-637-5300. Photo: Edward Harrison House, ca. 1877, 75 College Street, Brockport, NY. Listed on the National Register of Historic Places in 2010. Photographed by user:Jerrye and Roy Klotz, MD, 2008, (own work) [cc-by-4.0 (creativecommons.org/licenses/by-sa/4.0/)], via Wikimedia Commons, accessed May, 2015. Named for its founder, Kiel Brockway, it became an incorporated village on April 6, 1829. The main street divides the village into two sections unconnected by cross streets. The explanation given by local tradition is that, because of an ancient grudge between them, each of the two influential citizens who were largely responsible for the building of the village, planned his half without consulting the other. From 1844 to 1847 a factory in Brockport manufactured McCormick reapers. From 1870 to 1882 the Johnston Harvester Co., now the Massey Harris Co. of Batavia, had its plant here. The chief industrial plant to-day is the Quaker Maid Canning Co., a subsidiary of the Atlantic and Pacific Tea Co. which buys much of the vegetables and fruits produced in this section. Transportation facilities are provided by the Greyhound Bus Lines and the Falls Branch of the New York Central R. R. The Barge Canal [Erie Canal] also runs through the town. The village has seven churches and an active Grange. The Brockport State Normal School, opened in 1866, is housed in a brick structure erected in 1855 and later rebuilt in its present form of a central building with two wings 3 stories high. This institution is similar to other New York State normal schools, offering a 3 year course, including a training class based on the individual cadet system. Entrance requirements demand an average high school standing of 12 percent or above. 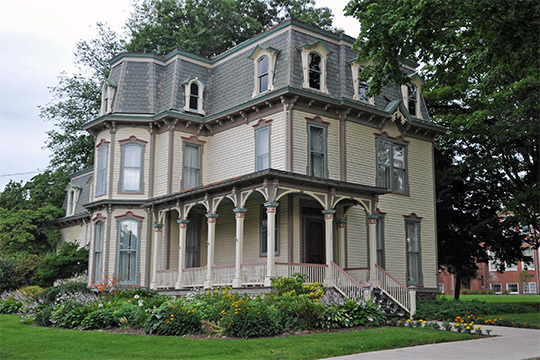 Brockport has many attractive old homes built in the early half of the 19th century. The home of Mary Jane Holmes, novelist, still stands, although it bears little resemblance to its original form; during her occupancy it was the scene of wide hospitality.